Paolo Freire refers to Erich Fromm’s The Heart of Man a number of times in Pedagogy of the Oppressed, how could I not read it? He wrote it while teaching at UNAM in Mexico City. I remember too, the only time I have heard a living person refer to him spontaneously it was walking through a London night with my friend Demetrio, as he exhorted me to read him on ethics, on good and evil. Fromm was the favourite philosopher of Demetrio’s grandfather, himself a philosopher in Reggio, who had helped raise him. His grandfather was one of the best men in the world, he said. Given the kind of person Demetrio has turned out to be, he is undoubtedly right. I read this over the summer…I think my next few posts will either be yay Malta or the oh.my.god kind of struggling to come to terms with the election. This is in the second category, a look at good and evil via Freud and Marx seems appropriate, especially when focused on human liberation in a way that I really wish postcolonial and critical thought had taken up. Rather than Freud via Lacan. I: Man — Wolf or Sheep? That is a question/ statement I have often heard in various forms. We are both, neither, really we can choose to move towards growth or decay, life or death. This is always the great choice we make, the great distinction in our actions and our pathologies. Towards life or towards death… So this does not shy away from any of the darkness inside, rather tries to grapple with its nature, and the springs of violence within us. Fromm distinguishes between violences, they sit along a spectrum. frustration, envy and jealousy are aspects of this, and while it can be twisted, ultimately it still is towards life. On to the violence in service of death…. Reading this is seems so simple, yet terrifying. This in fact makes sense of so much. I love Fromm in that he does not just focus on the violence, but on its opposite — the kind of person we can strive to be as opposed to the kind of person who lives in fear, who wants to shut things down, the fear in people I have tried and failed to work with, the fear I see splashed across the news. One example — and I like how Fromm anchors these more abstract explorations of the mind to that which makes no sense in the world yet that could destroy us all. Fromm asks, for example, how can we understand the lack of more widespread protest of nuclear weapons? All of us have a degree of narcissism, it helps us survive and so again, there are a spectrum of behaviours (and a curious list of behaviour that offer clues to the narcissistic individual, one that delights me as a novelist) explored by Fromm. These range from the simply self-preoccupied with the self, to the narcissism focused on ones children, to the psychopath. In both instances the core of the racial superiority was, and still is, the lower middle class; this backward class; which in Germany as well as in the American South has been economically and culturally deprived, without any realistic hope of changing its situation… has only one satisfaction: the inflated image of itself as the most admirable group in the world, and of being superior to another racial group that is singled out as inferior. God, narcissism explains so much, and most of the world’s religions and philosophies actually work to curb narcissism in multiple ways — Fromm sees it as the goal of (hu)man to overcome narcissism, but more on that next post. 2. The degrees of evilness are at the same time the degrees of regression. 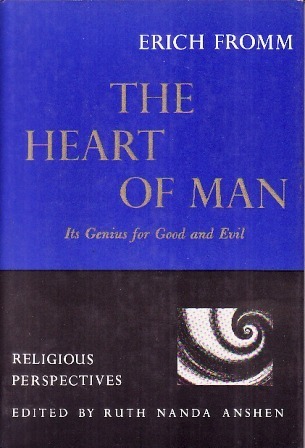 The greatest evil is those strivings which are most directed against life; the love for death, the incestuous-symbiotic striving to return to the womb, to the soil, to the inorganic; the narcissistic self-immolation which makes a man an enemy of life, precisely because he can’t leave the prison of his own ego. 3. There is lesser evil, according to the lesser degree of regression. There is lack of love, lack of reason, lack of interest, lack of courage. 4. Man is inclined to regress and to move forward; this is another way of saying he is inclined to good and to evil. 5. Man is responsible up to the point where he is free to (149) choose for his own action [and see the next post on the material constraints on freedom, which are vital to remember here]. But responsibility is nothing but an ethical postulate… Precisely because evil is human…it is inside every one of us. The more we are aware of it, the less are we able to set ourselves up as judges of others. I rather like this description of evil, I think it is something we must think about but in the West, liberal academia is a little too removed from their own wars and the death and destruction and torture and poverty that surround them to find this an important subject. But look at our world. What else should we be talking about, and in what other way than one well-grounded both in our psyche and the material conditions in which we live and struggle?